Leading Manufacturer of rigid flex hose from Mumbai. Unit Length 6", 12" & 18"
The unique Nex Flow™ Rigid Flex Hose is an all stainless steel hose that does not break after a few bends like competitive rubber hoses with simple copper inserts. It is resistant to creep and crimping. The Nex Flow™ Rigid Flex Hose is used to flex, direct and then hold in place air nozzles, air jets and other small blow off products. May also be used for liquid spray jets. Its all stainless steel construction allows its use in any difficult environment. 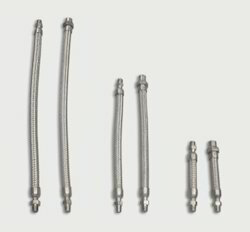 The rigid flex hose is available in three different sizes – 6", 12" and 18" and in two configurations - 1/4" male NPT welded end connection both ends or 1/4 male NPT welded connection one end and female NPT welded connection other end. Looking for Rigid Flex Hose ?